Wattstopper Plug load controller with ON/OFF button, measures 6.5-Inch x 6.5-Inch x 2.625-Inch. It has voltage rating of 120-Volt AC and current rating of 800-Milli-Amps. 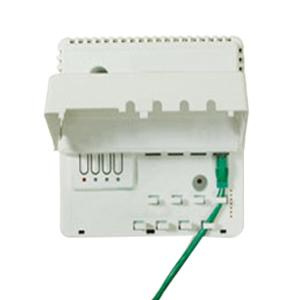 This 1-Phase room controller supports box mounting for making installation easy. It features Plug n' Go™ automatic configuration for quick installation and maximum energy savings. Room controller has zero-crossing circuitry for each relay to ensure reliability and increased product life. LED indicates the status of each connected load. It is ideal for switching outlets for lighting and non-essential equipment in private offices, open offices, lunch rooms, break rooms and other areas in commercial buildings. Room controller withstands temperature rating of 0 to 70 deg F. Room controller is UL/cUL listed and RoHS compliant. * Inventory displayed is accurate as of 04/19/2019 02:40 EDT.